Chaula’s is a characteristic, cosy Indian restaurant in central Brighton next to the seafront in Brighton’s historic Lanes. 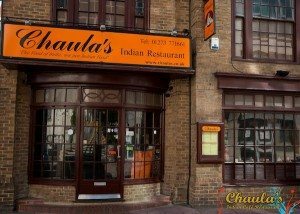 Chaula’s grew a name for itself in Lewes, by selling ready made Indian meals to a local deli, before opening a restaurant due to high demand for good Indian food, and later opening it’s friendly Brighton venue on Little East Street. When you first walk in, you are immediately greeted by strong smells of delicious curries and homemade breads. The restaurant is decorated with Indian paintings and decor, making it full of character and welcoming straight away. When we first arrived in the restaurant it was just starting to fill up with diners, the venue smelled terrific. 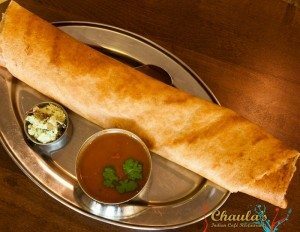 The menu at Chaulas includes classic Indian dishes, and exciting, homemade regional dishes that you will find hard to find anywhere else. It’s quite a big menu, so has lots to choose from and should be something to please everyone, and there is a whole section with vegetarian and vegan options too. As most Indian food is traditionally gluten free, their menu is very gluten free friendly, there is even an Indian style bread made with millet flour that is free from wheat and gluten, and delicious! But more about that soon. We both ordered a glass of wine each, and some poppadums to share. They had a couple of different poppadums to choose from, one plain, and the other with a masala topping. 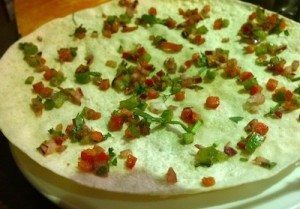 The masala topped version were sprinkled with finely chopped peppers, tomatoes, onions and coriander, and a mixture of spices. They were very tasty and very addictive! They came with really nice condiments, including one that I had never had before which was like sweet, powdered coconut with caraway seeds mixed through, yum! The wines were nice too, I had the Chenin Blanc which was rounded and sweet. 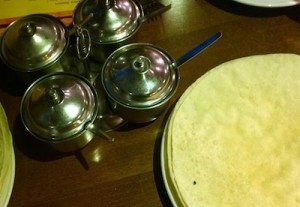 To start with we ordered the masala dosa, just the regular size, as they have a king size to choose from as well, and we ordered the chilli chicken starter which sounded good. We did have a little wait for our food, but they do state on their menu that everything is prepared from fresh, so there may be a wait for some dishes. When the dosa came out we were both very pleased that we didn’t order the king size, I couldn’t imagine how big that would be! It smelt amazing, and came with a couple of dhal curries on the side to dip in. The filling was a really good level of spice, not too much but with lovely flavours, and the dhal curries were flavoursome and a little sweet which complimented the thin dosa pancake nicely. 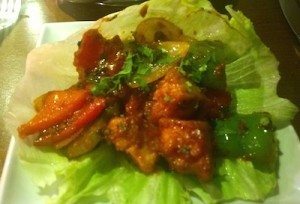 The chilli chicken was coated in a thin layer of cornflour before being deep fried, then covered in a spicy chilli sauce with softened onions and peppers, and served in a lettuce leaf for freshness. It was good, a little spicy for me, but I am a softy with chilli these days! As we finished our starters, we listened to the Brighton Ghost Walk walking past outside, ringing their bell and telling their stories. I liked the size of the restaurant, as it was nice and cosy, so it felt more intimate and comfortable, especially nice on a chilly evening! The mains were a hard choice, as there was so much on the menu that looked good. I usually ask for a recommendation if I can’t make up my mind, and I think I will next time I go, as everything sounded really exciting. My boyfriend decided to go for the Murg Makhani which some people may know as ‘butter chicken’. 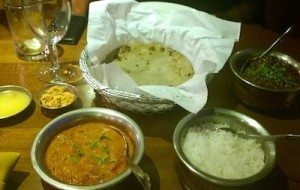 It’s a very popular dish in Indian takeaway restaurants where I am from in New Zealand, and has been my favourite curry for many years so I was really happy that he chose it! It was a spicier version that what I am used to, but the flavour was really one of the best that I have had! The waiter said to my boyfriend when he ordered that it was his favourite dish, (which instantly gave me food envy) but now I can see why! Now it has sounded like I didn’t enjoy mine, but I did! I chose a lamb curry that was cooked in a spiced mint sauce, and was really different but very delicious. The lamb was tender and plentiful and the flavours were really lovely, really different to what I had had before! I had to order the gluten free Indian bread as it’s not something that is often seen on Brighton Indian menus. As I said, it’s made from millet flour, and is most similar to a chappati I would say. It is served with ghee (clarified butter) and palm sugar which I would highly recommend utilising, as it really goes well with the bread. It was just really nice to have a warm bread to mop up the curry liquor with! I will definitely be going back to have more of that. This time we really could not fit in dessert, I was full to the top and I don’t think I would’ve been able to enjoy it if I did. We did have a lot of food though, so if you do want something sweet at the end, I would suggest not ordering as much as we did! There are a couple of gluten free desserts to choose from, and some classic Indian style desserts if you wanted to try something different. 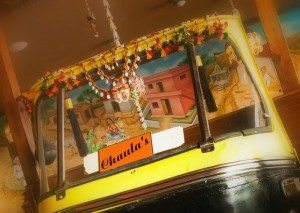 Visiting Chaula’s was a pleasant experience, I would like to go back to try more of their menu, it would be a nice place to enjoy dinner with some friends. With an excellent gluten free selection, and lots of vegetarian options, as well as exciting Indian dishes to try out..